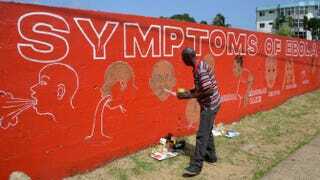 Street artist Stephen Doe paints an educational mural to inform people about the symptoms of the deadly Ebola virus in the Liberian capital, Monrovia, on Sept. 8, 2014. The efforts to treat people infected with the Ebola virus and to stop the transmission of the disease have led to a domino effect in Liberia that is causing infections to grow at an exponential rate. According to the BBC, potentially infected people take taxicabs to hospitals and treatment centers, the type of public vehicle that is now being considered "a hot source of potential virus transmission," the World Health Organization said in a statement released Monday. Once the patients get to a treatment center, there are often not enough rooms or hospital beds to treat them, so they go back to their towns and villages, untreated. "When patients are turned away … they have no choice but to return to their communities and homes, where they inevitably infect others," the WHO explained. This hodgepodge of practices, and how "conventional means of controlling the outbreak" are not working, has led the WHO to predict thousands of new cases of Ebola in Liberia in the next three weeks. Liberia already has the highest number of Ebola casualties in Africa. Approximately 2,000 of its people have died from the virus. Even though some countries have imposed travel bans to try to confine the virus, the results are having a harmful effect on the region's economy. The African Union encouraged some of its member states to lift such travel restrictions. "We must be careful not to introduce measures that may have more … social and economic impact than the disease itself," Nkosazana Dlamini-Zuma, the AU's commission chief, said.